The Los Angeles County Metropolitan Transportation Authority (Metro) today announced that it has received an unsolicited proposal that provides a unique approach to fund and accelerate some of its mega projects included in Measure M – Metro’s November ballot measure. The proposal was submitted by Parker Infrastructure Partners and centers around a concept that provides flexibility to fund projects in different stages of progress with the goal of accelerating and improving project delivery. While the contents of the proposal are confidential at this time, the approach offers a chance to deliver multiple Measure M projects sooner than anticipated. The Parker proposal has moved through phase one of Metro’s unsolicited proposal review process, and is now moving into the detailed proposal phase. Metro has been paving the way to consider different ways of delivering projects through innovative thinking – the impetus behind the agency’s first major industry forum, Transformation Through Transportation, in February 2016. That’s when Metro officials invited the private sector to bring the agency their ideas for helping Metro deliver projects sooner than they are scheduled. Metro has also received three other unsolicited proposals for specific Measure M projects; each is undergoing initial review to see if they have technical and financial merit. They include a proposal from ACS to accelerate the West Santa Ana Branch Light Rail Project through a public-private partnership (P3) financing model; and two proposals from Skanska – one to accelerate the West Santa Ana Branch Rail Project through a P3, and another to accelerate Phase 3 of the Purple Line Extension to UCLA and the Veterans Administration campus. In Measure M, Metro identifies other projects that are potential P3 candidates including the Crenshaw Northern Extension to West Hollywood, the High Desert Multi-Purpose Corridor in the North County,the 710 South Corridor and the Sepulveda Pass Transit Corridor. Metro is also reviewing a fourth proposal from Goldman Sachs to provide a regional network approach to develop and manage Metro’s High Occupancy Toll (HOT) lanes. Metro expects to receive additional unsolicited proposals for mega projects in the coming weeks. All of these proposals are dependent on Metro having an additional funding stream to leverage private dollars, either through Measure M or some future funding that is identified. Metro is implementing a “shovel ready” plan to bring key transportation projects to a shovel ready state in the event that previously unforeseen funding becomes available. Also, Metro recently named Ernst & Young Infrastructure Advisors, LLC, a recognized authority in the U.S. public-private partnership infrastructure market, to help Metro select the best delivery methods for advancing its major transportation projects in L.A. County. 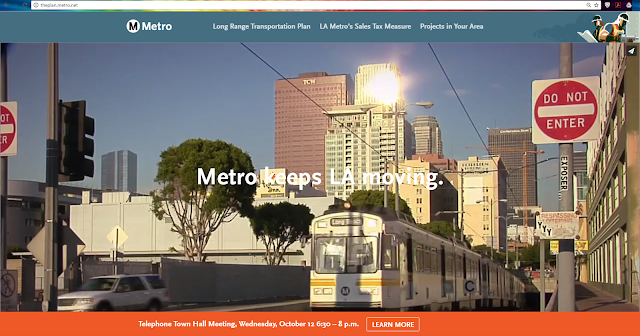 To learn more about Metro’s Measure M ballot measure, you can visit http://theplan.metro.net.